Manchester United controlled most of the possession in the game as they used Ferdinand and Vidic against Drogba with Scholes or Carrick dropping in to support when needed. The most impressive part of United’s possession game was their flank combinations between Cristiano and Evra. They were frequently able to break through as Evra would over or underlap Ronaldo as he dribbled inside. Ronaldo would frequently beat his man with diagonal dribbles onto his right foot which attracted the attention of either Essien or Cole who were meant to track Evra’s run – this obviously freed up Evra to break through and cross into the box. At times Ronaldo would lay the ball off into Evra and make a run himself as Evra would dribble and create from the flank – playing Ronaldo into a 1v1 situation or through the defense down the flank. A common SAF strategy is to use quick flank combinations to break through and then cross into the box with a high amount of players moving across the face of goal. Unfortunately for United, they couldn’t have Ronaldo create the chances AND be on the end of the crosses at the same time! On the right flank Hargreaves struggled under pressure and made poor decisions often. When Ronaldo scored his goal it was Scholes who drifted towards the right flank to combine with Brown and allow him to cross towards the far post for a Ronaldo header. Overall United were controlling possession very well and frequently threatening the Chelsea box through quick intelligent flank combinations. When they couldn’t break through the wing they would simply play the ball back into the middle where the incredibly pressure-resistant Scholes was playing. Scholes would frequently play long diagonal switches to Brown or Hargreaves to attack the far side – at times he even played them from the right flank towards Ronaldo on the opposite side. Hargreaves moved inside towards the center while Brown would push up on the right flank on his own. This was a well-balanced movement as it allowed either Tevez or Rooney to drop into either halfspace to receive and play through the flanks or combine across the center. Tevez did this more often during the earlier stages but Rooney did this much better later on. Because Chelsea defended in a 4-1-4-1 shape there wasn’t a lot of space in the center of the field, this resulted in higher pressure and less time on the ball to make decisions and to dribble. Tevez wasn’t making the proper decisions in these areas and holding the ball too long quite often and would get tackled by multiple Chelsea players. Rooney passed and dribbled much quicker in these situations. If he couldn’t play the ball into the flanks he would simply turn with the ball towards the center and play a pass into either Carrick or Scholes in order to receive a lay-off return pass and move with a proper field of vision and body position across the center of the field to play diagonals or shoot on goal. Defensively United played in a compact 4-4-1-1/4-4-2 with either Tevez or Rooney (mostly Tevez) pressing Makelele. The Red Devils weren’t forced to defend in a deep defensive shape very often as Chelsea focused mainly on breaking through in offensive transitions, but when they defended they were quite stable for the most part and always had pressure on the ball in their own half. A few problems arose when Lampard would drop deeper to help keep the ball with his dribbles and then play long diagonals through the defense. United had a hard time pressuring him in these situations, but it didn’t occur very often as he was mostly in the forward line with Drogba in possession. Essien would play at times in the halfspace while Chelsea were in possession rather than occupying the flank very wide as we are accustomed to seeing from fullbacks – this is most likely due to the fact that he’s a natural central midfielder and this is where he felt comfortable. When he would play more towards the inside Joe Cole would move very wide – this is very similar to the False Fullback movements which we saw become popular at Bayern under Pep Guardiola. This caused problems in Ronaldo’s marking as he didn’t know whether to stay wider or to move inside with Essien and allow Cole to receive the ball in 1 on 1s. Plus, Ronaldo doesn’t have the greatest defensive work rate as we all know. What happened most often was Essien would receive the ball on the switch in the halfspace and not be pressured as Ronaldo would stay wider. This created problems in defensive stability as Essien was able to create from this position due to lack of United access. A few times he played nice passes in between United’s lines for Chelsea to try to combine and penetrate with. He was able to help in counterpressing and stopping United transitions when this happened as well, though this occur too often as Chelsea didn’t have much of the ball. From the beginning of the match it was obvious that Chelsea looked to man-mark both Scholes and Carrick in the center with their two 8s while Makelele covered his own zone. Drogba would pressure the two United central defenders while Cole and Malouda would mark their opposing fullbacks. This is a pretty straight-forward and common approach in defending – even today – about 8 years after this final. Some problems arose for Chelsea when Scholes and Carrick would begin rotating or when 1 of the 2 moved higher while the other dropped deeper. This distorted the defensive structure of Chelsea which looked normally like a 4-1-4-1 – but now the central midfielders were getting dragged away from their positions. Needless to say, this caused problems in properly covering zones across the field and defensive access to the ball in crucial areas – mainly in the halfspaces. 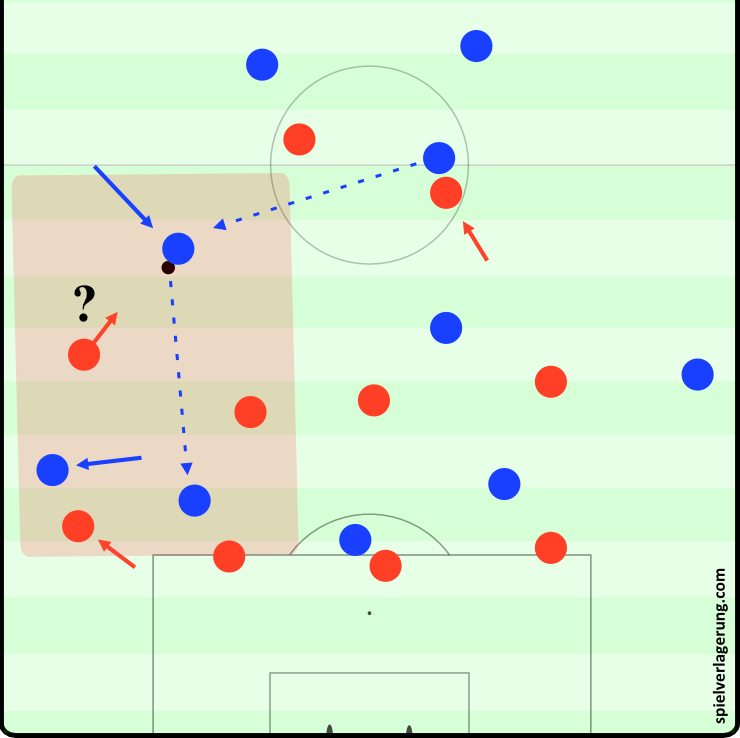 Though the Chelsea 8s (Ballack and Lampard) did a good job of protecting their zone once Carrick or Scholes would move too far away from the center, resulting in the Blues maintaining an acceptable level of compactness. This helped force United towards the sidelines where Chelsea shifted quickly and had high numbers there due to the 4-1-4-1 shape and tried to isolate the attack. Due to Chelsea’s wide men man-marking the United fullbacks and tracking their runs, Ronaldo was able to drop into the halfspace to receive vertical passes as Evra would make an overlapping run and drag Joe Cole away. Essien wouldn’t follow Ronaldo so deep and central to vacate his position. Meanwhile Lampard was marking Carrick which left Ronaldo free in the halfspace to turn and dribble diagonally inside. He was able to play the ball into Rooney for a quick return lay-off pass around any pressuring Chelsea midfielders to open himself up in front of the Chelsea defensive line and create on a few occasions. When in possession Chelsea’s fullbacks both looked to move high and wide while Lampard joined Drogba in the center in front of the United defensive line. Ballack and Makelele remained deeper and looked to circulate possession before playing the ball into the forward line of 4 for combinations to penetrate. However, they didn’t have much possession in this match and looked mainly to try and score from quick counterattacks through the 3 forwards after defending in their 4-1-4-1 shape – but the Red Devils were able to control most of those offensive transitions quite well. After fulltime the score remained 1-1. Both teams ended up making all 3 substitutions but no important structural or strategic changes occurred, it seemed it was mostly able making sure neither turn succumb to the fatigue which accumulates during a 120 minute game. 4 minutes before the end of extra time Drogba managed to get himself sent off for slapping Nemanja Vidic – which is a pity as Drogba was quite good at penalties. Ronaldo missed his penalty but Manchester United were still able to come out of the dramatic final penalty shootout as victors. If we judge which team deserved to win more based on the play throughout the whole game, Manchester United were deserved winners in this matchup. The average age of the entire squad was 24! Which is quite impressive given that there were still quite a few players from the Class of ’92 on the team. This young team was able to play some great football with the ability to retain possession under pressure, combine quickly through the wings, and to attack the box with a high number of players – exactly what we would expect from a Sir Alex Ferguson team. After years of disappointment, rebuilding, and patience since their last Champions League victory – Manchester United were once again able to compete at the top level for the next several years. By AdinOsmanbasic in Football History on May 20, 2017 .